So after my first piece about the Cardiff Design Festival and some of the more business/design related events I thought I would write a bit about the smaller events that centred around designers socialising and generally getting to know each other. It's an odd paradox while most designers spend their entire day developing to things to communicate and make lives easier we sometimes aren't the most social of people. So I think the social events are really at the core of Cardiff Design Festival. Without designers on board then the festival is never going to be what it could. So the events that I went to were (for obvious reasons) the NakedWales pub quiz, and the Design Wars out the back of Milgi. I think both offered something totally different. The quiz was a great chance for people to catch up or meet, have a few drinks, and answer (or maybe not) some quiz questions. 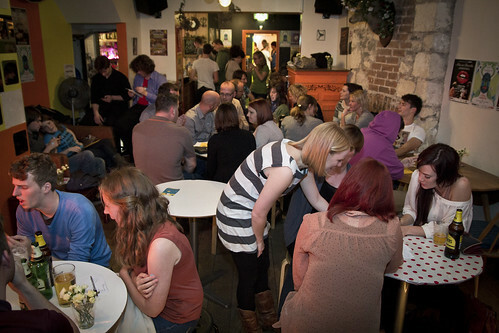 The great thing is that we have done three of these quiz's over the years and each time it has got busier and busier until this year when we ran out of chairs. So while I can't say what it was like as I had to read the questions out I think people had a good time? Let us know what people thought. The Design Wars started last year and I think from hearing about it from other people it was a highlight. So this year I had to pop in and see what it was all about. I think the idea is great and it pulled in a variety of of students, practicing designers and just people interested in what was going on. I think the thing it made me think was that the Design festival did start to bring together recently graduated designers together. Almost the length of the festival has allowed them to grow up with the festival and now as people who are practicing they are now supporting it.